Home / News / Politics / Billions worth of Marcos’ assets confiscated by Cory’s admin: where are they now? Billions worth of Marcos’ assets confiscated by Cory’s admin: where are they now? Cash, jewelry, treasury bills, shares of stocks, trust funds, bearer certificates, real-estate properties, aircraft, vessels, buildings, condominiums, apartments, houses, newspapers, radio and TV stations were quietly seized and surrendered to the administration but the location of the said assets cannot be found. Some sources even state that it may quite possibly be with the closest people around Cory. The said administration miraculously investigated and settled billions worth of assets of the late Marcos’ colleague and front man, Jose Yao Campos. The 99 corporations and subsidiaries in Vancouver, Canada of Campos was investigated, prosecuted and judged by one agency, the PCGG. It is incredibly injudicious for such an agency that fights for good governance to commit an act that fronted as an act for the better good, when in reality it was an act of greed and betrayal. With the seized ill-gotten wealth that the PCGG confiscated, an outburst of people around Cory went from ‘rags to riches’, a clear sign of instant wellness from quite possibly ill-gotten sources. They front-lined societal magazines and decorated their recently bought mansion with luxury vehicles that were bought with the fattened bank accounts all while the people that the Aquino administration fought for suffered in poverty. Not one person from the Aquino administration underwent the constitutional mandate in Section 1, Article XI, which states that "Public officers and employees must, at all times, be accountable to the people, serve them with utmost responsibility, integrity, loyalty and efficiency, act with patriotism and justice and lead modest lives." And to make things interesting, there was the existence of immunity from civil and criminal prosecutions that the Aquino administration vested upon a large number of Marcos’ people. Entities who should’ve gone through public investigation, prosecution and incarceration. 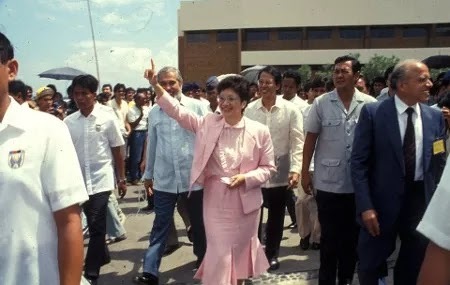 The PCCG empowered Cory’s administration to utilize the confiscated ill-gotten wealth of Marcos and to grant immunity to possible whistle-blowers in order to keep them silent about the totality of the said wealth. After 17 years from its creation, the PCCG has been dubbed an agency of greed, graft and corruption. An agency surrounded by a number of legal controversies, vast unfair deals and multiple accusations of graft and corruption. It’s been given P649 million in order to recover all the Marcos’ wealth, set up multiple offices and employ staff that amounts to more than 1500, local and foreign. And the said agency still may act as quasi-judicial entity that has unbelievable power to seize, issue summons and grant immunity to prosecutions. It can investigate cases of corruption, order the prevention of concealment, destruction or squandering of anyone’s assets and prevent other instances of plunder by succeeding administration through the creation of safeguards. The PCCG is clearly overpowered that is comparable to a god as an agency. The PCCG recovered cash, kind and Swiss bank pledges amounting to P4,216,654,434, less than P10 billion and P18,593,524,000 respectively, in the 20 years that the Marcos’ administration have plundered. This was an incredible disappointment due to the estimates of the PCGG claiming that the plundered assets be around P13,057,250,000,000 in pesos, under the assumption that the gold hordes were included. There is some kind of foul play that should be in motion here, due to the fact that Marcos publicized his administration’s 20 year official accumulated budget to be at only P486.42 billion. With a paramount sum that the PCCG has yet to explain, President Rodrigo Roa Duterte has been called by the people to bring justice to such an extreme act of graft and corruption that haunts and riddles the country till this day.